I can't believe I've watched all four hours so far. This thing rots. The first episode didn't remotely offer any explanation of how this supposed utopia on Earth was brought about (oh, except random farmer pours glasses of oil for the Saudis to drink). And the end of the second episode, really? The aliens have shown they have the power to stop bullets from great distance and even revive people who have been shot through the chest ... but Karellen is powerless to stop Peretta from firing a shotgun at him point-blank, and only the last remaining syringe of Magic Revival Juice can save him. I think I need to re-read the book to wash the show out of my mind. I remember liking it quite a bit. I have been enjoying this, for the most part, though I also couldn't believe that Karellan could get shot. Unless that's going to be a plot point in Part 3. Yet another mini-series where I need subtitles to decipher what some of the actors are saying, mainly Karellan. Is the sound mix particularly bad then? Because I can hardly believe that Charles Dance would be mumbling his lines. I'm streaming it off SyFy.com to a 4K HDTV and even on the normal internal TV speaker, and the sound mix sounds fine. Dance is definitely not mumbling his lines. I also said WTF at the gunshot scene. Really? A bullet, really????? Surprised there haven't been mass suicides or religious rebellions, but I gather this is a super-condensed version of the book. That said, Karellen's makeup is visually stunning. I can't say it's quite as good as Tim Curry's transformation in Legend, but it's verrrryy close. Just sneaking in to get a feel for whether to watch this. But I'll say that, at six hours, it can't be very condensed. I seem to recall the book is about 175 pages. But yes, I've had a problem with the sound mix, too, and certainly I never missed a word that Tywin Lannister said. I've had spots where I've rewound a couple of times and still could not understand, and it's almost always Dance. I found part 3 kind of boring. It picked up at the end with Milo's story, but the first 2/3, with the children becoming evolved, seemed to take an awful long time to get where it was obviously going. But I'll say that, at six hours, it can't be very condensed. I seem to recall the book is about 175 pages. Yes and no. 175 pages of prose can imply and describe hundreds of thousands of years of action. And, a single sentence can describe a key event that might take fifteen minutes of screen time to explain and unfold. There's also the very real mechanics of writing/filming/editing a complex tale to fit the American tv schedule, where there have to be commercial breaks every ten minutes or so. So, the story has to be broken into logical-ish chunks to fit. Anyway...It's been an ok show. The source material is the sort of sci-fi that doesn't really get read by too many people these days, especially younger readers, so I can sort-of forgive some of the editing decisions. It's to be expected. Overall, though, I've liked watching a few hours of sci-fi that doesn't involve mysterious government men, fistfights, gunplay every 15 minutes, global warfare, etc. etc. They managed to keep the feeling more to the contemplative/intellectual side of things. Yeah, it wasn't perfect, but I think a lot of that was dictated by the source material. Like a lot of Sci-Fi of its era, it's a story about ideas. It doesn't have a hero's journey thing where a character overcomes a challenge and grows in the process. The characters are pretty much just there to comment on the themes and get carried through the sweep of events. The weakest parts of the adaptation IMO were the ones where they tried to create arcs for the characters. That doesn't ultimately work because at the end of the day the story isn't about the characters and they can't really change anything. The story is about what happens to humanity as a whole, and we're looking at these particular humans as our examples. For our purposes, Ricky Stormgren's story could just as well have been about the 82 year old woman from Seoul. And there's been a lot of talk about how depressing the end is. I think that's because while the theme is essentially about parents passing the torch to their children and ultimately being left behind as they move on, what we're presented with is solely the end of the old world. There's nothing about what humanity evolves to become. I'm torn about that. It's what Clarke focused on, and I'm not sure how you would go about really turning, "we all merge into a godlike cosmic consciousness" into accessible television. But without it, what we've got left is just "we get old and die," not "we grow old and die but our children carry our legacy forward into a new world." I think it should have been a much more hopeful experience. I've made it to the end of the second part, and will probably trundle to the third part, but, while this works as a book, it ain't working as a mini-series. On the otherhand, Thorzdad is right about everything they got right about adapting it. I hated it. Everything interesting was too quickly and easily resolved. The story lacked depth and believability. Did that astrophysicist conflate constellations and star systems? Also, cookie dough ice-cream as the pinnacle of human achievment? In current day it reads as a metaphor about spoiled Millennials. Even though they tried to update it, the story really shows it's mid 20th century age. The complete lack of any meaningful female character development; not that the men fair much better. The paternalist utopia it envisions where daddy alien overlord knows best. Where the writers made changes they made it worse. For example the whole Saudi Oil pipeline scene. First of all basic geography shows that Saudi oil pipelines don't connect to the Sahara. Also glasses of oil? In episode one the aliens fix a kid's gun shot wound and then stop the bullets flying toward their prophet. However in episode 2 this ability is lost and instead only the magic vial can save the overlord. The lack of consistency and cringeworthy errors in things like basic geography make it difficult to suspend disbelief. They changed the storyline a lot, but if they thought they were updating it, they were wrong. The women characters are just like the ones in old live-action Disney movies: they don't want change, they want to hold their men back from being engaged with change and simply be hubby or daddy, they're blandly normative. When Rick Stormgren says the thing is as big as the world and his girlfriend replies "You're my whole world" I thought I'd throw something. The Greggson mother and even Milo's girlfriend ("Don't go!") are equally drags on the action. 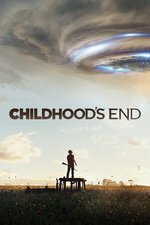 A real version of Childhood's End wouldn't get bogged down in all this. Yes, that's partly because Clarke, as a mid-century SF writer and gay man, wasn't terribly interested in women. But surely they could've written in a woman scientist who was excited about change, and not just looking on the action with big sad eyes. Another point: the thing about Karellen's people is that they can't read minds or do psychic stuff, it's their tragedy. They're incredibly advanced and intelligent but their role is to conduct emergent species to join the Overmind while not being able to do so themselves. They don't have any psychic ability, which in the book is depicted as the first flickers of the human ability to break through to a different mode of being. Having Karellen's people do things like magic up Stormgren's dead wife or his honeymoon suite from his memories is an example of exactly the sort of thing they're unable to do.